The Silver Britannia coin has been one of the Royal Mint's most popular creations since it was first issued in 1997, ten years after the original Gold Britannia. One of the mint's signature coins, the Britannia is also one of its greatest successes. Each year, collectors and investors eagerly await the release of the new gold and silver coins and demand for the 2019 1 oz Silver Britannia is likely to be as high as ever. Don't miss out – add the 1 oz Silver Britannia (2019) to your order with coininvest.com today. Struck from one troy ounce of .999 pure silver, the 1 oz silver Britannia is incredibly popular with numismatists who are drawn to both the coin's purity and its classic reverse design. The reverse of the 2019 1 oz Britannia silver coin features Philip Nathan's famous 'standing Britannia' the personification of Great Britain and its national symbol. 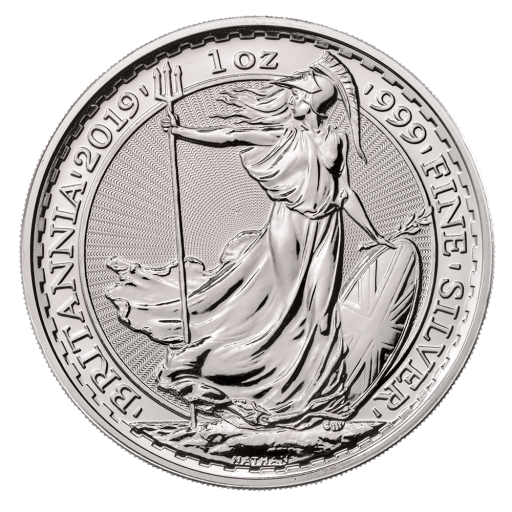 With a face value of £2, the 2019 1 oz silver Britannia is currently the largest of Britain's legal tender coins and, as such, is VAT Free and Capital Gains Tax (CGT) exempt. The coin's obverse bears the Jody Clark portrait of HM Queen Elizabeth II against the mint's modern guilloche background. Known as the 'fifth portrait' this engraving of the Queen was created in 2015 for the State Opening of Parliament. At the time, Her Majesty was 88 years old. For the event she chose to wear the glittering King George IV State Diadem crown and the Diamond Jubilee pearl drop earrings. The 2019 1 oz Britannia silver coin is certainly a safe investment. Silver is known to keep its value even during times of economic crisis and Britannia's are portable, sought-after and highly tradeable. Order the 2019 1 oz British Silver Britannia today with coininvest.com for fast, secure delivery. Coins are supplied singly in sachets, in tubes of 25 or in monster boxes of 500.